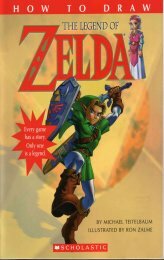 Aside the the usual game guides published throughout the years, Zelda has had some of its very own literature available for purchased. Sadly, most of these books are now discontinued, though you can sometimes get hold of them through Amazon marketplace sellers second-hand or the online auctions like Ebay. Some of the books are available for download as scanned copies. The range includes several 'choose your own adventure' style books where the reader could make decisions on how the action panned out, including plenty of alternate endings and puzzles to solve. 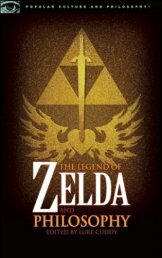 There's also a novelisation written to coincide with the release of Zelda V: Ocarina of Time, a book all about legend of Zelda through philosophy and much more. Find out more below. 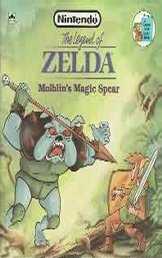 Synopsis: On his way to rescue Princess Zelda from Ganon's clurches, Link encounters a Moblin with a magical spear. 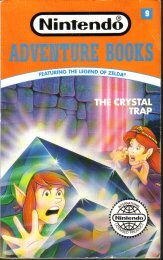 Synopsis: The evil wizard Ganon casts a spell that encloses the Triforces in impenetrable glass cocoons. Because the Triforce of Courage is in Link's heart, he becomones encased in glass. Princess Zelda must free Link so together they can defeat Ganon and save Hyrule. 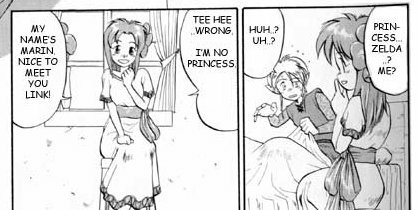 Synopsis: Princess Zelda welcomes a handsome stranger to Hyrule after he heroically saves her life. But when he begins to show a suspicious interest in the Triforce, Link begins to distrust him. What is the princes' real mission in Hyrule - and what is his true identity? Synopsis: Basically, a novelisation of Zelda: OOT on the N64. However, the story also provides some hints on how to defeat most of the bosses and solve some of the major puzzles as well. 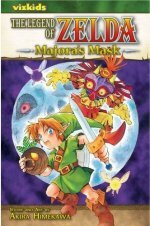 Synopsis: A booklet that shows you how to draw some of the more popular characters and monsters from The Ocarina of Time. 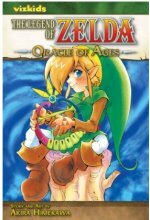 Synopsis: This "decide your own adventure" book is based on the Nintendo Game Boy Advance game, The Legend of Zelda: Oracle of Ages. Link is magically transported to the troubled land of Holodrum, and it's up to the reader to help him restore peace to the land. 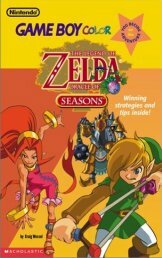 Synopsis: This "decide on your own adventure" book is based on the Nintendo Game Boy Color game, The Legend of Zelda: Oracle of Seasons. Link is magically transported to the troubled land of Holodrum, and it's up to the reader to help him restore peace to the land. Synopsis: The contributors to this volume consider many questions including; What is the nature of the gamer�s connection to Link? Does Link have a will, or do gamers project their wills onto him? How is space created and distributed in Hyrule (the fictional land in which the game takes place)? How does time function? Is Zelda art? Can Hyrule be seen as an ideal society? Can the game be enjoyable without winning? The Legend of Zelda and Philosophy not only appeals to Zelda fans and philosophers but also puts video games on the philosophical map as a serious area of study. Back in 1990 in America, several issues of a Zelda comic were published by Valiant. 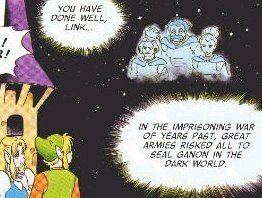 There were 5 issues all together, which contained similar drawings to that of the cartoon, and based on the characters from Zelda I and II. They expanded much more on the Zelda universe and of course, Link and Zelda's relationship (with nods to the cartoon in that sense!). They contained many familiar characters from the games and even Link's family featured and his home country of Calatia. 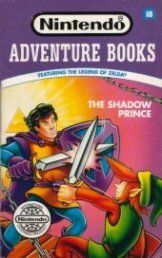 In the Nintendo comics series there was also a Zelda special issue. My favourite all-time issue is number 3, which features the excellent story 'The Power' and part 2 "The Price". It shows the danger of how the Triforce can be easily misused and has one of my favourite Link/Zelda moments. 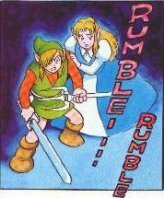 The full, scanned versions of the comics are available for download below, courtesy of Zelda Legends and Zelda Power. These can be saved to your computer and viewed using any image progam such as windows picture viewer. Synopsis: Stories include "He Also Serves" and "Missing in Action". Synopsis: Stories include "To the First Power" and "Trust Me". Synopsis: Stories include "The Power" and "The Price". Synopsis: Stories include "Queen of Hearts" and "Thief in the Night". Synopsis: Stories include "Coming Home" and "Day of the Triforce". Synopsis: Stories include "Assault" and "Choices". After Zelda III: LttP was released, Nintendo Power issued a series of comics based loosely on the game itself and these were given away with the main magazine from January 1992 through to December 1992. They were later also released in a book format in 1993. The comics were written and illustrated by one of Japan's highly regarded comic creators, Shotaro Isinomori. 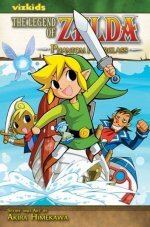 David Butler of Zelda Legends downloaded the full comic which was available for free at Nintendo's official Zelda Universe site and kindly converted it from pdf into jpg format. I have put all 12 chapters together into one file and it can be downloaded below and saved to your computer. 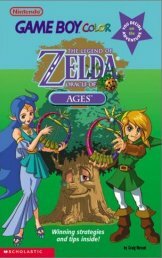 Synopsis: The full story of A Link to the Past with added details told in 12 chapters. 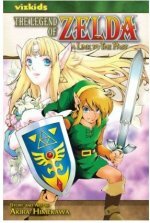 In Japan, Zelda is adored by many gamers so much, that a lot of artists produce official Manga comics based on the games, 4 koma manga comic strips and fan comics known as doujinshi. Some of these beautifully illustrated comics can still be purchased but some websites do have scanned (and sometimes even translated) versions for readers to enjoy who otherwise wouldn't ever get to see them. 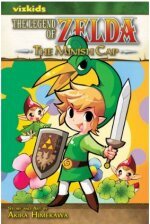 The official mangas from Ocarina of Time through to Minish Cap are illustrated and written by Akira Himekawa; a collaboration of two women, A. Honda and S. Nagano. 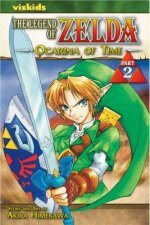 I own two Ocarina of Time mangas in this series and they are gorgeous and definitely worth purchasing. 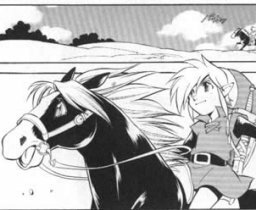 There are also Link to the Past and Link's Awakening mangas by Ataru Cagiva. 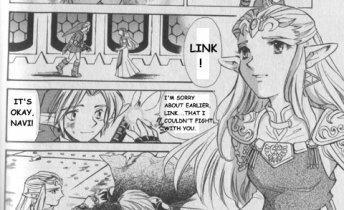 These mangas expand on all the Zelda backstories and often explore character relationships more fully than what the games do. Melora has one of the biggest collections of doujinshi, manga and 4 koma. Her site contains information about them and she is working on a massive project to get as many translated as possible. Information on all the mangas by Akira Himekawa and Ataru Cagiva. You can view a translated Adventure of Link-based doujinshi here. Below are a few more samples of the various mangas. They are nearly almost always in black and white with often only the first few pages being in colour. An important note is mangas always read right to left, rather than left to right and the English versions are in keeping with this Japanese tradition. 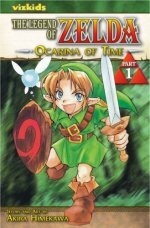 Synopsis: This covers the first half of 'Ocarina of 'Time' up to Link adventuring to the Fire Temple in his quest to save Hyrule from Ganondorf. 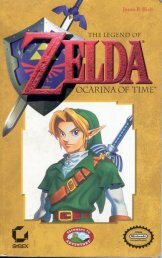 Synopsis: This covers the second half of 'Ocarina of 'Time' with Link now an adult going forward in time to save Zelda and Hyrule from Ganondorf's clutches. Synopsis: Whilst searching for his old faerie friend Navi, Link encounters Skullkid who steals away the Ocarina of Time, ensuring Link then travels to the mysterious land of Termina. Synopsis: Summoned by Din, the Oracle of Seasons, Link travles to the land of Holodrum to battle the evil General Onox and save the land and its inhabitants from a terrible fate. 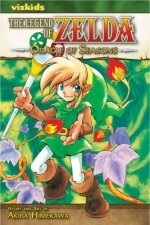 Synopsis: Link finds himself travelling to Labrynna where the Oracle of Ages, Nayru, has disappeared. Veran, the Sorceress of Shadows, has developed a scheme to alter Labrynna's past using Nayru's powers. Synopsis: Link is now a Hylian Knight serving Princess Zelda. When Shadow Link kidnaps Princess Zelda Link needs the legendary Four Sword to aid him but getting it means battling the ancient evil power Vaati. The Four Sword splits Link into four different versions of himself, and working together isn't as easy as it seems. 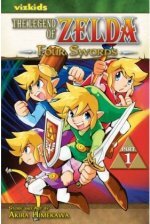 Synopsis: In the second part of Four Swords, the 4 Links reach Death Mountain and discover a terrible secret about the Dark world and the evil power behind Vaati. 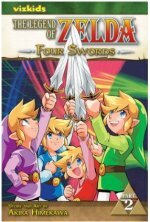 To defeat this great enemy, the 4 Links must find a way to become one again in order to harness the power of the Four Sword! Synopsis: On the day of the Picori Festival, Link and Princess Zelda go to watch the sword-fighting tournament. The winner is a strange man named Vaati, who has come to claim the Light Force. However the Light Force is missing and Vaati turns Princess Zelda to stone! To save his friend, Link needs the power of the Picori Blade, but only a certain master swordsmith can reforge it. Synopsis: Link is awakened by a telepathic message from Princess Zelda, who says that she is locked in the dungeon of Hyrule Castle. Link must find the legendary Sword of Evil�s Bane, the Master Sword in order to defeat Agahnim and Ganon; and save Zelda and the other maidens descended from the sages who originally sealed Ganon in the Dark World. Synopsis: Link�s friend Tetra is taken prisoner by a ghost ship, and Link falls overboard when he tries to save her. When he wakes up, he finds himself embarked on another fantastic quest! The discovery of the Phantom Hourglass sets Link on a journey to rescue Tetra, find the Sand of Hours and break the curse of the Temple of the Ocean King. Come aboard with Link for an amazing adventure on the high seas!